Here's a recipe that's easy to customize. For example, although it's a great meat-less meal, you can easily add ground hamburger. Although I prefer to make this lasagna without pasta, using slices of zucchini in place of noodles, you can use noodles, if you prefer. Also consider adding diced squash, mushrooms, or any other vegetables you happen to have on hand. Remember, you can make this ahead, too, and place it in the freezer for one of those nights you're too busy or tired to cook. Heat oil in a large skillet; add green pepper, onion, and garlic. Cook over medium heat, stirring occasionally, until vegetables are tender. Add remaining sauce ingredients. Keep cooking, stirring occasionally, until sauce comes to a full boil. Reduce heat and cook, stirring occasionally, half an hour on low heat. Remove bay leaves. While the sauce is reducing, mix 1/4 cup Parmesan cheese, ricotta cheese, eggs, and pepper in a medium bowl. Refrigerate. Slice zucchini into thin (about 1/4 inch) strips, down the length of the vegetable. When sauce is done reducing, spread 1 cup sauce on the bottom of a 13 x 9 in. baking pan. 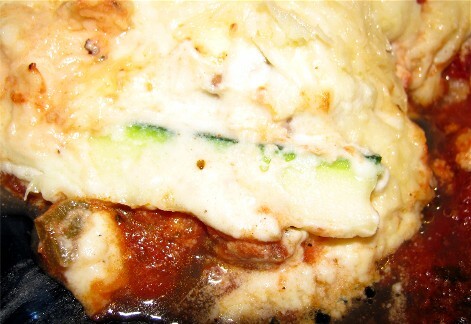 Lay zucchini slices all across the top of the sauce, just like you'd do with traditional lasagna noodles. Spread 1/3 of the cheese mixture over the zucchini. Repeat layers. Sprinkle with cheese topping. Bake for about 30 minutes, or until heated through and bubbly. Allow to stand for about 10 minutes.